It sounds easy this whole “love yourself” thing but how do you do it and what does it mean? I’ve heard people say this years and years ago when I was going through the stages of hating myself, being emotionally disconnected to the point that I was self destructive. It never made sense and seemed too easy for someone who couldn’t possible understand what I was going through, to tell me to “love yourself” Are you supposed to simply wake up one day and declare “I LOVE myself? I have slowly come to realise through my own personal journey that it is NOT selfish to put yourself first and to be kind to the person who is ultimately the most important person in YOUR life – YOU. Because I was so disconnected with my self, I went though most of my life being an eager beaver – you know the type who over extends oneself to please others, say yes to things because you are afraid of letting people down and then regret it later as it will compromise your time or your priorities in one way or the other. I attracted the wrong type of people and experienced a lot of heartache by people who made me feel sad, used and broke my confidence into tiny little pieces. I also used to spend very little time on my own and instead crammed every waking hour in the company of people and kept busy. It was as if I hated to be alone or lonely. Now that I have stepped back from myself, I can see symptoms of this in other people and I regret being in that frame of mind. I am happier being on my own. In fact I thrive in it! It makes me appreciate the time I spend with my friends and family even more. I pick and choose who and when I spend time with so I am not giving away too much of my energy, draining my resources and ensuring that its quality over quantity. In the age of Facebook and the numbers game, it does feel like there is pressure on us to be someone to everyone, have lots of friends and be everywhere to be seen and heard. How many times have you said or felt …… “it made me realise who my friends really are? What does that mean? Your expectation was not met. Not everyone will respond or reciprocate in the way you expect them to. There have been many times over the years where I have bend over backwards to fulfill my obligations but I cannot say the same when it came to doing something back for me. I had to question two things – why was I over extending myself and why people weren’t doing the same for me? Well the truth of the matter is that people get spoiled when you keep giving. When you don’t appreciate yourself enough, you end up making up for it by being a crowd-pleaser and people feed off that energy. As for why I wasn’t getting anything in return – I was probably hoping that by over giving, people would love and appreciate me ….ultimately making me feel better about myself. It was like being on the ledge – its a very temporary feeling of safety and yet one false step and you are in danger! Unfortunately the more you give, the less you get. So take care of self, be kind to yourself and then your giving will be more meaningful and there will be less expectations on your part. The result ? Less resentment and heartache for you. 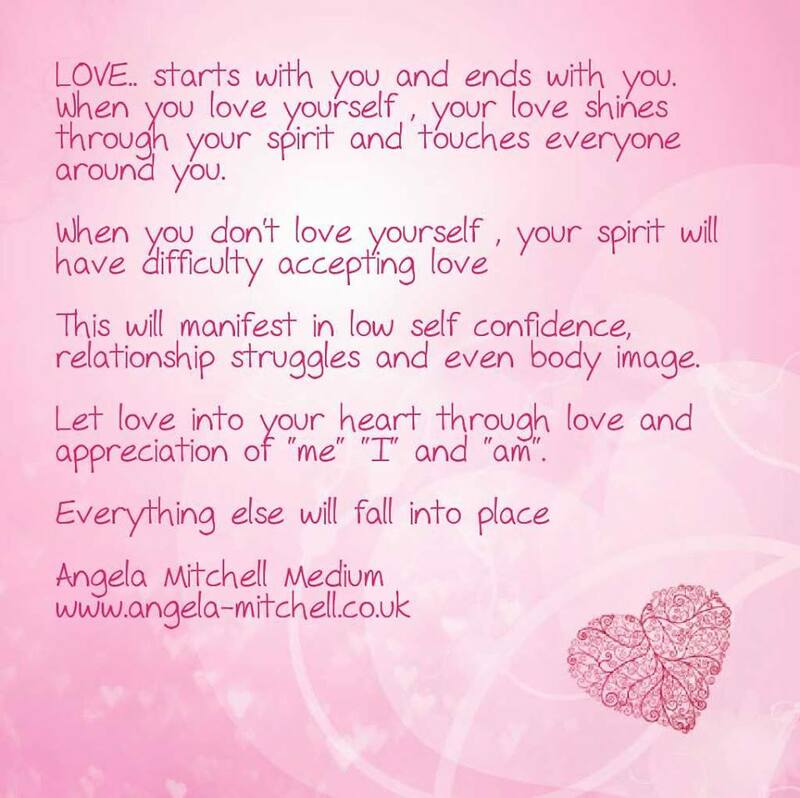 My spiritual journey helped me get to the core of my issues and I learned to love myself. I realised everything starts from and ends there. I realised where I was going wrong. It helped me to be more comfortable in my skin and love myself more. Here are some practical steps to your journey to make the important changes that will lead you to the same place ….. So what does “Love yourself” mean to me? My time is precious. It is okay to be discerning by picking and choosing what I want to be involved in. Spending time on my own. Learn to sit and do nothing occasionally or opt for a night in with food you love and a book/film or music that makes you feel good. Find your comfort zone and you will start appreciating this quiet time. Reconnecting with self is ultimately the easiest and best way forward – remind yourself of what you were passionate about when you were younger. Look at what you can do to take action on it. For example, I used to love art but lost my way throughout the years and I realised how much I missed it a few years ago. 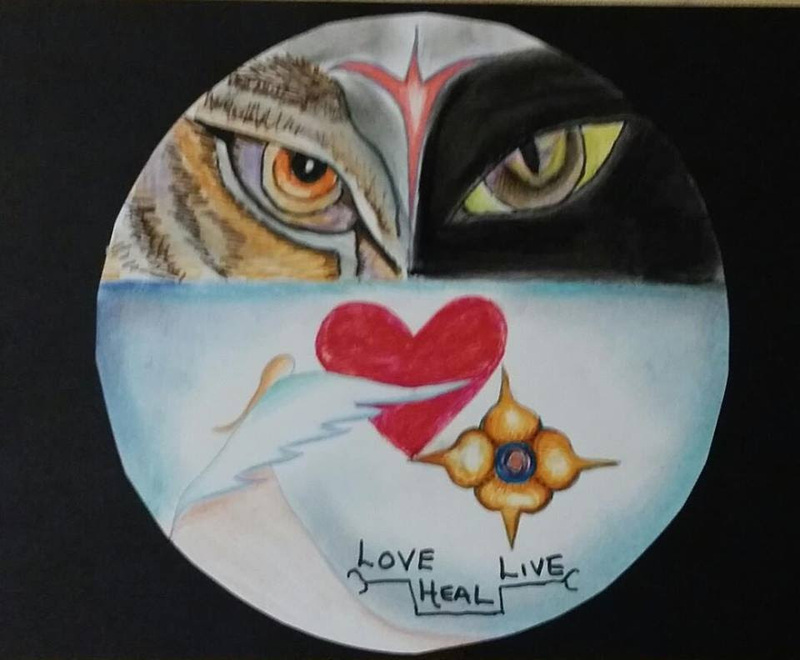 It started with a sketch book and a pencil and now I have developed my creativity to the point people want to buy my work! Do things that make you happy. Start with this and then extend it to helping others and being there for others. If you only concentrate on giving then you will never be able to take occasionally. Make a happy list. Get some paper and pen and write down things that make you happy – music, food, travel, places, coffee, people. books, films etc. Every now and then when you feel low — go back to this list and pick one item from the list and do it — an easy pick you up! If you don’t want to do something or can’t do it….be honest and say so. Don’t complicate life by saying yes and then fretting over it later. Prioritise yourself – stop putting yourself last on the list! Put yourself on the top of the list sometimes. It is not selfish to look after yourself and your needs. You are of no help to anyone if you are worn out and bitter! Mirror image – the best way to love yourself is to spend a few minutes each day looking at yourself in the mirror. Accept every flaw, every wrinkle and imperfection. Love every perfect sparkle and shine that emits from your face. Love the depth of your eyes, every fleck and the light that goes straight into your soul. Do this often and you will see small changes in how you feel about yourself. Start cutting the cord with people who have you feel unworthy. Create three columns on a piece of paper. On the first column, title it name, 2nd column is for “positive feelings” and name the last one – “negative feelings”. Now put down the first name that comes to mind and then feel the person and how the affect you. Is it a negative or positive feeling? Fill it with as much or as little information. Now go back and look at the name and see how that person has an effect on your life. Is it a positive or negative impact? Are you happy to have this person in your life? Write down what you can do to change this feeling. Talk to them? Avoid them or change the way you react to them. Believe me this is a powerful and very pragmatic way to filter through and declutter your life. It also takes the emotion out of the process as you are working on a very visual and practical way. PS: Please feel free to share this post via the social buttons below and leave me a comment if you have any questions or feedback. I’d love to hear from you. This entry was posted in Affirmations, Channeled Writing, healing, How to, Spiritguides, Spiritualguidance and tagged connectwithself, friends, friendship, guidance, happiness, happy, healing, howto, love, loveme, lovemyself, mirrorwork, negativity, positive, positivefeeling, self worth, selfimage, spiritualguidance, whislist. Bookmark the permalink. Thank you for this morning with so many lovely and important words and thoughts to read and think about. And I will share this with others.